When you are operating your business from your home, you need to create a space that’s efficient. More often than not most home-based business owners, find themselves in a pickle just because they forgot to stock a few essential supplies. They often seem trivial when you have them around, but their absence can potentially halt business operations. To ensure uninterrupted productivity, it makes good sense to buy these supplies when setting up your office. It’s also a good idea to keep a tab on them and replenish their stock as and when you need. To keep this post useful, we are leaving out obvious things such as computers and high-speed internet. These are things you already know you need and there is little chance you would forget them when building an office space. 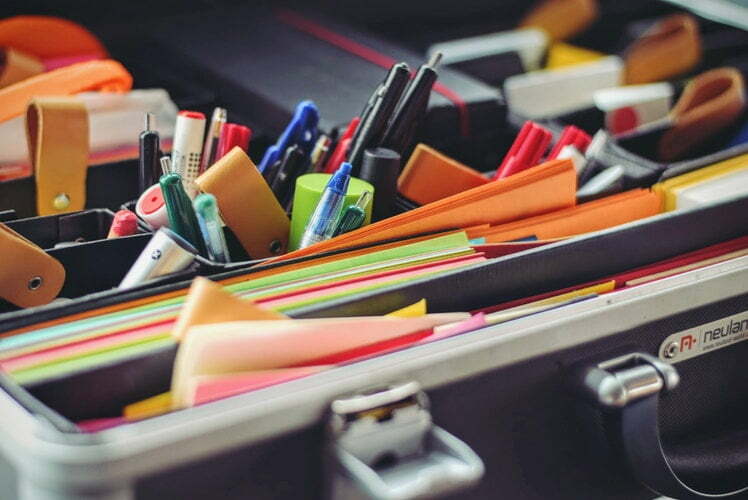 Without further ado, following are 10 office supplies most home-based business startups need. Heavy Duty Stapler and Clips: The first step towards increasing productivity is effective organization. Staplers and clips help you keep documents organized and your office free from rogue A4 sheets. Ample Supply of Physical Folders: Right from licenses to invoices, you might need to keep physical documents in your office. To keep things organized you need an ample supply of folders. Filing Cabinet: You cannot just keep those folders on the floor. Depending on the number of documents you need to store, you need to invest in one or more filing cabinets. Extra Printer Cartridges: Running out of printer ink in the middle of printing that all important invoice can prove to be a tragedy of epic proportions. Buy extra color and black printer cartridges and re-order as soon as you deplete a particular cartridge. Carrier Bags and Packaging Materials: Depending on what type of business you own, it’s probably a good idea to keep a stock of branded carrier bags and packing materials. If you have a eCommerce business, then buying luxury carrier bags and mailing bags online is essential. Even businesses that provide services keep a stock of branded luxury carrier bags for corporate gifting and for sending samples and items to clients and customers. These are really helpful when you have to deal customers and clients on a regular basis. For example, a lot of real-estate brokers keep a stock of luxury carrier bags at their home offices. This ensures they can pack property brochures inside these beautiful bags and hand them to potential high-end customers. Surge Protector: When it works it can protect hundreds of dollars of equipment. Hard drive crashes due to sudden power surges are not uncommon and it can leave even well-oiled businesses crippled. Whiteboard with Markers: From training to brainstorming, there is no denying the convenience of an old-school whiteboard. You can write down your weekly targets or even quickly note down a phone number for later use. At the risk of generalization, almost all offices need whiteboards and its many benefits only reveal themselves once you get it. Fire Safety Box: These special fireproof boxes protect important documents from fire damage. This means if there is a fire you can evacuate without the worry of losing important documents. Checkbook: While online payment is slowly taking over, check payments are not going anywhere anytime soon. Businesses in the USA still prefer making check payments to their vendors and when paying utility bills. Keep a checkbook around just in case. Sticky Notes and Pens: Leaving short messages and sticking them to random surfaces is both fun and useful. Even though there are sticky note applications, they are never as practical as the original ones.